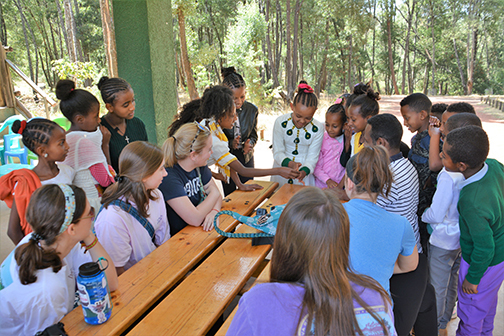 Over spring break this year we were part of a group of eight Saint Mary's girls who went to Addis Ababa Ethiopia along with Ms. Chernin, Dr. Holstein, and Dean Healy. It was a life-changing experience and a trip that we will never forget. We made new friends, tried new foods, and were exposed to a culture different from our own. When we first got off the plane and stepped into Ethiopia we were a little nervous. We had never been anywhere like Ethiopia before and did not know what to expect. When we saw the kind, smiling faces of our tour guides, Bini and Dougie, our worries faded. Bini and Dougie quickly made an effort to learn all of our names, and soon enough we were all joking and laughing with each other. They really encouraged us to immerse ourselves in the culture by trying new foods and trying to learn the language they spoke, Amharic. We did many different things throughout our eight days in Addis and we each want to share our highlights of the trip. My favorite things about the trip were meeting new friends, working with children in the community, and visiting the home of a child who attends Destiny Academy, a school that our group worked with. I enjoyed working with an after-school and weekend program for underprivileged children called The Meklit Project. The first day we arrived at Meklit we were greeted with smiling and screaming faces excited for new playmates. As Ms. Chernin pointed out to us, we dove in head first and immediately started to chase the kids around and play with them. Though they spoke very little English each child made an effort to come up and introduce themselves to us, which almost made me cry with tears of joy. We first started blowing up balloons and hitting them around with the kids and then brought out bubbles and string for friendship bracelets. The kids had never really played with bubbles before, so they were a great surprise. When we pulled out the string several of us started to make bracelets for the kids and then they joined in to make bracelets for their friends. We then pulled out paint for finger painting, which ended up turning into face painting, but after our faces and their faces were covered in paint they helped us clean our faces with wipes. We returned to Meklit several days later to paint murals in one of the rooms of their building. We filled in sketches of Spiderman, Mickey Mouse, and Simba with paint to help brighten up the space. When the kids came back from school they were so surprised to see the paintings - and they loved them. We then returned to making friendship bracelets and kicking a soccer ball around. On one of our days we went to the lower school campus of Destiny Academy, a private school in Addis. We showed up to the school right after nap time and right before the kids were supposed to leave to go home. We got to interact with the children a little bit, but soon after we got there we left to walk out into the neighborhood to visit families who live there. We split up into three groups, each with a chaperone and a representative from the school. With Maggie Seidel and Dr. Holstein, I visited the home of a 16-year-old boy and his 70-year-old father who are both HIV positive. We walked a couple minutes through the neighborhood, which was a combination of houses behind gates and houses made up of tarps and metal siding. We walked into the home of this boy and his father which was made up of four walls of tin siding and a tarp roof. The house had one light and a TV but no running water or amenities that we are used to such as kitchen appliances or bathroom appliances. Though neither the boy nor the father spoke English we had a conversation with them about the father's life and how he and the son were doing. We learned through the principal of the school, who translated for us, that the father was married before, lived in a more rural area and he abused his wife. He now believes that due to these actions, which he is not proud of, God is punishing him by giving him HIV/AIDS. The mother of the son died within the first year of his life, but the father says that if she were still alive today that he would wash her feet everyday and be extremely kind to her. This was very interesting to hear as the man described how his faith had grown through his illness. To end our visit, we prayed together in Amharic which was an amazing faith experience for me even though I did not understand what they were saying; it was a great feeling to have shared that time with people who I had might not otherwise have met. Throughout the week we learned about fistula, an injury that can occur during child birth that affects many Ethiopian women due to a variety of factors including malnourishment, lack of infrastructure and access to medical care, and marriage at young ages. We watched a documentary about fistula and the Hamlin Fistula Hospital. Later in the week we visited both the hospital and Desta Mender which shares property with the Hamlin College of Midwives and is a place where women can recover after giving birth. I was familiar with what a fistula was because I had read two books relating to the subject before our trip. It was interesting to see the hospital and the work of Dr. Hamlin whom I had read about. Dr. Hamlin, who started the hospital came to Ethiopia with her husband and after discovering how many women were suffering from fistulas and learning more about how to operate on fistulas, they created the hospital dedicated to this issue. It was inspiring to see the product of a woman's hard work and vision. What we saw during the visits exemplified the positive impact a person can have on the lives of others when they follow their passion. It was also impacting to see what a community and a nation can do when they work together to solve problems. Overall, our trip to Ethiopia was one that we will never forget. We are already discussing how we can go back. Throughout the week we bonded with each other and formed friendships through our adventures and conversations. Now that we are back we have a group of friends to talk to in the hallway. We both have had Ms. Chernin and Dr. Holstein as teachers before, but it was fun to get to interact with them outside of a school setting which helped all of us come out of our shells. We all saw a different side of Dean Healy as he went from our Dean of students to a National Geographic photographer taking giant camera with him everywhere we went. In addition to the friendships we formed, we were able to learn about the culture of Ethiopia and see things and meet people who are incredibility inspiring. Everywhere we drove in the city, we saw building developments and bustling city life. Every person we met was driven by a passion and served others with incredible kindness and generosity.